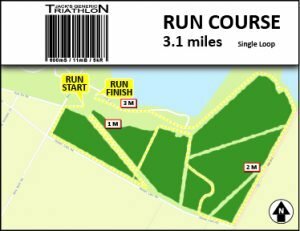 The Jack’s Generic Triathlon sprint distance course is a 600-meter swim, 11.2-mile bike, and a 5K run. 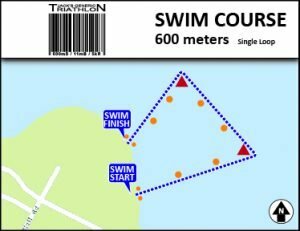 The swim course does an out and back rectangle in Walter E. Long Lake. The swim course has orange marker buoys, and red triangle turn buoys. Swim with the buoys on your left. 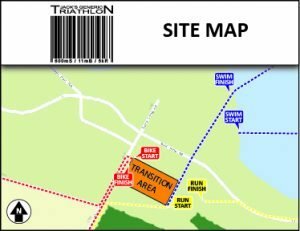 The event features on centrally located transition area that has restrooms and an aid station that can is available before or after the swim and bike. 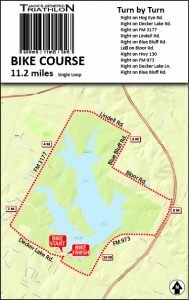 The bike course goes around the lake for 11.2 and features some rolling hills. There is a hill after the third right turn; it is best to downshift before entering the turn to make it up the hill with ease. The run is on a mix of off-road path and paved road. The run course returns to the finish line where participants receive their finisher medal and a reusable water bottle filled with ice cold water. There are 3 Aid Stations on the JGT run course. The first aid station is located just outside of transition by the “swim in/run out” entrance. This aid station is easily accessed before the swim. The next two aid stations are just before mile 1 and at mile 2 of the run. It is best to prepare your bike before the event starts as there is no aid station on the bike course. Aid stations will be stocked with water and electrolyte hydration drink.